I’ve changed my username as much as possible to “esquetee” (like SQT) since librarienne and epist are already taken in many places, and so I’m combining my old blogs Epist and Librarienne into one new blog – Esquetee. All the old posts from both this one and Epist have been moved to the new blog Esquetee. If you’re interested, I also have a portfolio finally (hurray!). Please update your RSS feeds to the new feed, as I will not be posting any longer here. I will keep the old posts in place, though, so as not to break links. This semester (Spring 2012) I’m involved with a class called Writing for the Web. This class is full of experiments and a wonderful group of students who have been really great sports about trying said experiments. One of the things we’re playing with is using twitter for out-of-class discussions (and sometimes in-class, too). I’ve been curious about how other classes are using tools like twitter for their communication, so I’ve been collecting hashtags and readings. I’m listing them here without commentary in case other folks are searching for such materials. If you know of a class or a relevant reading, please share in the comments! This weekend I have the good fortune to make a short appearance in a library and information science class for Emporia State University. It has been at least two years since I had an LIS class, and the chance to peek at the discussion boards reminded me of all the conversation, collaboration, and sharing that one enjoys when in a class. We haven’t even met yet but I have already learned a lot from the collegial, professional students of LI835. I’m hoping the links below might be interesting or eye-opening or useful as they continue to tackle very important issues in librarianship. For an entirely different demonstration of assessment, take a look at the semiannual newsletters from the Mortenson Center. Instead of numbers, charts or graphs, the newsletter reports on the Center’s activities in a narrative, people-focused style. The collection of newsletters then become something like an accessible, digestible mini annual report. They also function as a wonderfully convenient and searchable archive of the Center’s history – something I have wished for in every library I have ever worked in. A creative approach to the stand-by library workshops – this regular series offers topics directly relevant to faculty, graduate students, and highly motivated undergrads. These patrons are, after all, the primary audience for such optional extracurricular resources. The information about authors’ rights also ties in closely with the university’s impressive institutional repository: http://www.ideals.illinois.edu/ which is also based out of the library. With both adamant fans and avid critics, the Khan Academy has been mentioned in many conversations about the potential direction of higher education. Paul LeBlanc imagines a future in which the university is primarily a testing and accrediting institution, with much of the instruction and learning becoming an individual, independent endeavor of the students themselves. If LeBlanc is even partially right, what does that mean for the future academic library? I will readily admit that this speaks to a personal pet peeve of mine: using “generations” as an excuse for stereotypes. I have done tech training to people of various ages, from various countries and cultures and all stereotypes – no matter what they might be based on – are just that, stereotypes. Not valid. Not reliable. Not true. Some of the most enthusiastic participants in my iPad workshops have been older than me and some of the most hesitant have been younger. Age does not correlate to any tech skill whatsoever. Likewise, age also does not correlate to a deficiency of skill. We do our patrons a severe injustice when we make assumptions about them — the “digital native” myth is just another example of that. Should we use social media to eavesdrop? Set up a search in HootSuite, for example, for any mention of your university or library? Social media has to be personal. Canned material won’t cut it. Allowing the library’s social media presence to be funny and have a personality will be far more successful. For example: when we change the status message on our chat widget, we get more chat questions. create a free collaborative notepad by starting a “pad” and sharing your unique link with your team or audience; see the notes appear before your very eyes! web workflows for dummies! I love that you don’t have to know any code, just put pieces where you want them. I have one set up to send my twitter favorites to an Evernote notebook automatically. A while ago, when I wrote about organizing your news feeds in Google Reader, I mentioned a couple news reading apps for the iPad. Finally, I’ve made the time to really compare the apps I’ve been using and explain why I use the ones that I do. 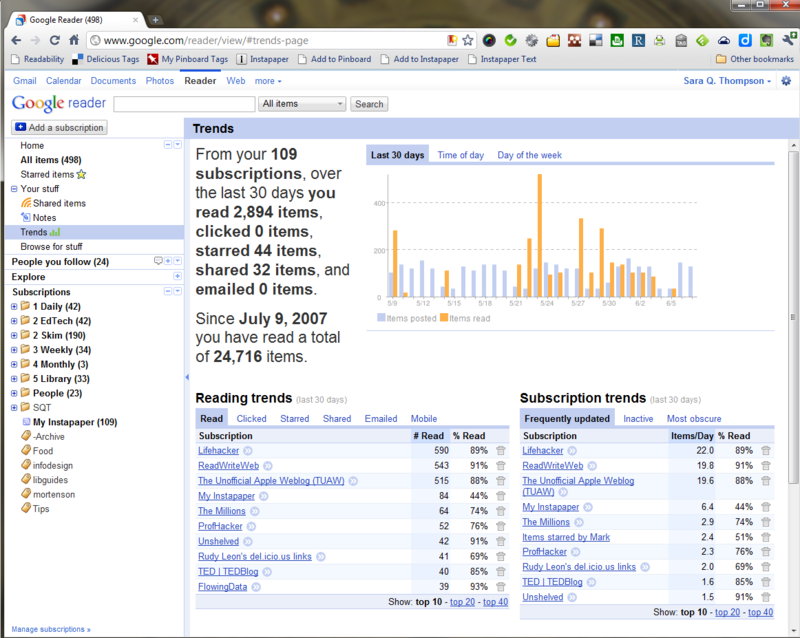 To see a chart of the features I look for, and the apps I considered, see this Google Spreadsheet for RSS Apps. Please feel free to add your comparisons, too! In case you’re wondering why the pretty magazine-style apps are not here, let me just say that they simply don’t mesh with my news reading workflow. I do appreciate Flipboard and have shown it to several other people, but I take a more methodical approach to my news feeds. I haven’t yet seen a way to incorporate such a workflow into something like Flipboard, though I still try it out once in a while. I started using Mr. Reader just a couple months ago. Two big reasons I switched to it: 1) my other favorite RSS app, MobileRSS HD, kept crashing… a LOT. I was over it. 2) I started using Diigo for all my bookmarking and Mr. Reader lets me send links directly to Diigo with tags and description. If there was some way to also highlight text in an article, Diigo-style, I would be the happiest camper ever. Likes: At first the interface appeared a little cluttered, but once I started using it, I found it helped me go through my news feeds more quickly since I didn’t have to open every article to take action on it. I love the little sound effects that are sprinkled into basic functions of the app, but have no fear – you can turn those off. I also appreciate having the favicons next to the feed titles and thumbnail images from each post. A wonderful bonus feature is the ability to add new blog subscriptions within the app. But it would be nice if we could then put the new feed into a folder, as is done in MobileRSS HD. One of the best features is having 4 different view options for your feeds: RSS (just the blog post), Web (view the original, with comments), Mobilizer (like Web but simplified), and Readability (full post). The ability to easily and consistently bring in the full post on those super annoying blog feeds that only send out truncated articles is the stuff of rainbows, my friends. And finally, a bonus feature that has become one of my “must have” tools is the ability to open links in non-Safari browsers such as Atomic Web, Mercury, or iCab. Those three are the only alternative browsers available in the app so far, but it also gives the option of using Send2Mac, which I have not played with yet. Dislikes: Seriously, how can this be a Google Reader app and NOT have a “Share with Note” option? I’m hoping this gets added in an update soon. It’s one of the biggest features that keeps Mr. Reader from being my one-and-only RSS app. It has had 5 updates since it came out in April, so the developer appears to be fixing things on a monthly basis. I also wish there was a way to get back to the original blog post after following links – as in, a back button? One little thing that would be nice but isn’t crucial, would be a setting to choose between scrolling a post up to see the next post, or scrolling sideways to see more posts. I prefer sideways but the default right now is up/down, which causes a problem sometimes when it’s not obvious that I’m at the end of a long post. I have a love / hate relationship with MobileRSS. They have some great features and a nice interface, but the app crashes so often I have deleted it off my iPad at least twice. And yet, it can do a couple things other apps can’t do (like Comment View and adding new feeds), so then I end up putting it back on. But I can only use those features when it’s not crashing, of course. Likes: The interface is similar to Reeder in using swipes between posts, but it doesn’t mess around with the goofy pinching piles of paper metaphor that Reeder uses. Going through posts in portrait mode is lovely – the text fills the screen but with good margins on the sides, and you can simply swipe to the next post like you’re turning a page. Using the book metaphor for news reading appeals to me, but for longer text I prefer this style of seeing one post at a time over the Flipboard style of showing several at once. On another note, MobileRSS seems to be one of the few apps that can display a subscription to another Google Reader user’s starred items – not shared items, mind you, but starred items. A couple people have shared their starred item feeds with me so we can discuss more posts without cluttering up each other’s shared items. But only MobileRSS and Feeddler will display them. Argh. Dislikes: The crashing. And have I mentioned the crashing? If they could fix that problem, and add Diigo integration, MobileRSS HD would win back its crown as “Sara’s only RSS app” away from Mr. Reader. If you go back through the reviews in the App Store of MobileRSS HD you will see many disgruntled customers accusing them of stealing their design from Reeder. Reeder and Flipboard set precedents when it came to designing an interface for the iPad, not just for doing computer-like things on an iPad. I used Reeder for quite a while alongside MobileRSS HD, but as you’ll see from the Google Spreadsheet comparison – there is quite a bit that Reeder can’t do… for my purposes, anyway. Likes: Clean interface, swiping between posts, holding on a link brings up the full action menu so you can send it to Instapaper without opening it. Dislikes: It has no free version to try out and it’s never been cheaper than $4.99. It has no “Night” theme so if you try to read in a dark room, the screen is blindingly bright, even with the iPad’s brightness turned down all the way. Many apps are starting to incorporate their own brightness settings now, which can get darker than the iPad’s settings, thus avoiding some strain and headaches for night readers. But then, Reeder is guilty of one of my all-time greatest pet peeves in iOS apps — putting the settings in the iPad Settings app. I hate this. If I want to change something about your app, I’m only going to think of it when I’m using your app. Why should I have to switch to something else entirely in order to change your app? 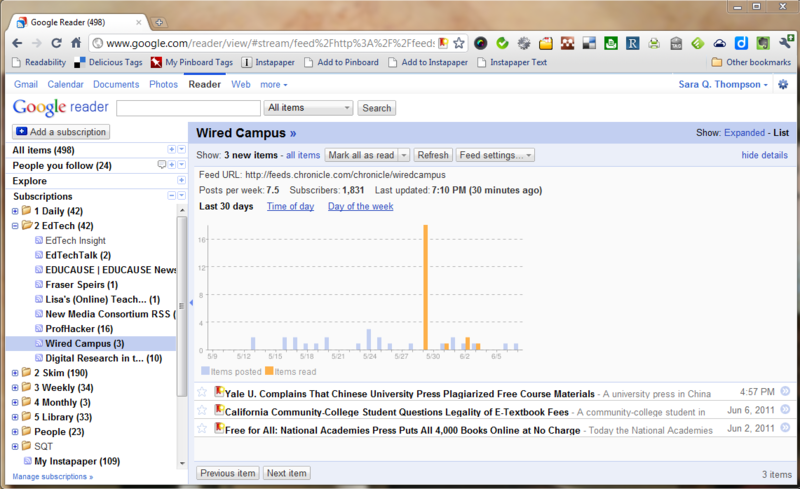 The biggest reason I don’t like using Reeder much is the way it displays people I follow in Google Reader. I prefer to see each person’s shared items separately, but Reeder only shows them in a big muddle and it’s hard to tell who shared what. Both Mr. Reader and MobileRSS HD separate the shared items by person sharing. This makes much more sense to me, for whatever reason. Readict ($4.99) – This is the app I’m most excited about. It was made by Diigo for Diigo, but works with Google Reader and Twitter favorites. However, it has not had many reviews yet in the App Store – only 7. It came out in early July but has only had one update so far. I like to see regular update activity on apps, because there is almost always something to fix, and I want to know that the developer is committed to their apps. I have it on my wishlist at AppShopper in case anything changes. River of News ($3.99) – I picked up this app when it went on sale briefly several months ago. It has an interface very similar to Reeder and MobileRSS HD, but with a lighter touch and little letterpress-style details in the design. However, it also has many of the same problems as Reeder. One interesting addition that keeps River of News in the running is the ability to add customizable gesture commands for shortcut taps. I’m watching to see where this app goes, but it hasn’t had an update since February. Perfect RSS Reader ($.99) – This has some similarities to River of News, including gesture options, but the interface and design give the app a style of its own with very thin lines and sandstone coloring. It definitely has potential but there are little things that keep me from using it regularly, such as only displaying the feed list in a pop-out window, and not having a night-reading theme. What’s your favorite way to read news and RSS feeds? I’d love to get more suggestions! A lot has happened in one short year. We have a new Reference and Instruction Librarian now who brings a whole wonderful set of mad skills into the mix. We have a coffee shop in the library’s lobby for the first time. The campus has switched to a semester calendar rather than terms, and we have students from the Writing Center doing their evening hours in the Library – which has been a goal for the library for a long time. When I think about how much everyone has accomplished in the last 14 months, I am astounded. When I think about how much my own job has changed I’m downright dizzy. This semester started out a little strange since Mark and I had to be out of the country when classes started. I’m also trying out a very different schedule: I’m working Mondays to Thursdays from about 10 am to 8 pm. “About” means I actually arrive much earlier but the upside to these long days is that I don’t come in at all on Fridays. I wanted to try out a schedule like this in hopes of being available for the widest range of people on campus. I set my “office hours” as 4pm to 8pm – a time when anyone with iPad or classroom tech questions can come find me and get some answers. The 4pm to 8pm window straddles the time from faculty getting out of their last classes to the evening students arriving for their night classes and the on-campus students start pouring into the library for their late night study time. If I had the stamina to stay up later, I would probably get far more questions between 9pm and midnight, but 8pm is already pushing my bedtime. I have to admit, the evening hours have been more productive than I expected. I often have a regular stream of questions from both students and faculty, and when I don’t have a visitor I can get more catch-up work done because most staff and faculty go home by 6. Most of my daytime hours are spent answering questions on the phone, in email or going to people’s offices to show them how to do something. I love all this. It feels like That Thing I’m good at. But there is always more to do, too, and it’s very easy to feel very behind. I’m also seeing an unexpected benefit in having more morning hours at home. I’m starting to set a routine of waking up, writing for at least half an hour, reading some RSS articles and with the arrival of our brand new treadmill, I’m even able to squeeze in a work out, which I am absolutely ecstatic about. These things never happened after work even when I was leaving at 4:30. Typical work days leave me wiped out by the end of the day so why not make it the true end of the day? So far, being personally productive in the morning is far more successful than it ever was in the evening. Next up – I want to set up some specific workshops (the persistent challenge – when will people come?) and find a way to reach out to more students. I’m hoping we can have a couple longer faculty workshops during the J-Term. In the spring it would be great if we could start beta testing a couple learning management system options and Google Apps. The biggest change I want to make is creating a culture of ongoing professional development across the campus. One of the long workshops I would love to do would cover Getting Things Done and the most basic elements of project management wrapped up in a package to help employees with time management, productivity, and communication. That’s a huge goal and I have to keep reminding myself that it won’t happen with one workshop. I have to figure out a way to incorporate these elements a little bit at a time until they seem second nature. If you have some ideas, I’d love to hear about them! Just as live theatre continued after radio, and radio survived TV, and TV goes on despite the internet, so, too, will paper books coexist with digital books for a long, long time. At first, ebook creators tried very hard to mimic the older sibling, which had a few centuries to mature into its own style, with page numbers, chapters, tables of content, margins, and nice bindings. Finally the ebook is starting to experiment with a style of its own, though the wardrobe changes are happening fast, depending on where you look. Below are a couple ebook trends that I find particularly interesting. A couple background bits to better understand my interest in ebooks of late — first, I’m a bibliophile and librarian. Second, while I was getting my graduate degree, I took a few classes on user experience design and usability. At the time, I thought about usability in terms of websites for library catalogs, databases, and so on. I was fascinated to see how storytelling became an element of user experience, and now I see user experience entering the realm of book design. In the paper form, books did not seem to stray far from the traditional codex format. Now that ebooks are morphing into apps, almost anything is possible. The table of contents doesn’t have to be a table anymore, chapters don’t have to follow each other, and the whole notion of page numbers can be turned into something else entirely. I’m excited to see the traditional idea of “what is the book” turned upside down. Perhaps, after a heady phase of experimentation, we’ll end up using the old book trappings after all, even in our ebooks. Or maybe, as future writers grow up reading ebooks of varying formats, they’ll begin to write in completely different styles that push ebook formats into further changes. Another trend popping up again lately (seems to come and go in waves) is serialization. When I think of serialized books, I think of old London magazines in the late 1800s selling pieces of Charles Dickens stories and then later, selling Sherlock Holmes cases to such raging popularity that Sir Arthur Conan Doyle had to bring the character back after killing him off. I find it somehow strange that there hasn’t been a online serialized story that has gone viral quite like Dickens or Conan Doyle did in their day. The blog format seems like the perfect tool for such a narrative unfolding over time, but it just hasn’t taken off in that way … as far as I know, at least. The closest thing I’ve seen to something like this was the @MayorEmanuel twitter feed during the Chicago election. As readers become accustomed to using devices like the Kindle and iPad for subscriptions, I wonder if serialized fiction will make a comeback. We have some serialized fiction now in the form of TV miniseries and sitcoms, but I’m hoping for something better. Deep down I see serialized fiction as the format that will usher in a tidal wave of social reading — people talking about the latest piece of the story over dinner with friends or over coffee at work. Maybe it’s just me, but one big thing I think we would gain from a shared experience of literature (over the shared experience of TV, for example) is the space for imagination, the wiggle room for interpretation that is hardly present (or to a much lesser extent) in the visual and aural world of TV. Would you subscribe to a novel? Would you read a chapter at a time as it was released, or save them until you had the whole book? And most of all – what do you see as the biggest difference to emerge so far between ebooks and paper books? You might have heard about Amazon’s announcement that they have created a textbook rental program. I think this is a great step — anything that makes it easier for faculty and students to find cheaper textbook alternatives with an interface they might recognize is a good thing. And I love that students will be able to access their notes even after their rental book expires – that is very important. For your sake and mine, I’m hoping one huge glaring problem can be fixed with the rental Kindle textbooks before university classes get started in the Fall. The problem is how editions of books are shown in the store. Right now, if I go to the literature section of the Textbook store, I’ll see titles such as “Pride and Prejudice (Barnes & Noble Classics)” or “A Tale of Two Cities (Penguin Classics)” but the Kindle books attached to these items are not the B&N Classics or Penguin Classics editions, and this will be VERY important for students who are assigned a particular edition by their professors precisely so they can read the supplemental materials included by Penguin or B&N. The Kindle editions are just Project Gutenberg knock-offs, and the students will get very frustrated since they can’t figure out how to get the edition they actually need for class. PLEASE, start putting some decent publication information on the Kindle books! I would truly love to see Amazon enter the Textbook market – I think Amazon makes an excellent ebook product, except when it comes to anything that requires a particular edition of a book. As a book company, you of all companies should know that all editions of one title are not the same. Please fix this so we won’t hear the complaints come this fall. I’m sure there is a much better way to explain what I’m trying to describe here. Do you see this as a potential problem for your campus? How would you fix this? At the end of March, we started an iPad Pilot for faculty at my university. We had 20 devices to give out, but ended up having 30 people involved because other faculty and staff who had purchased their own iPads wanted to be a part of the group, too. Our virtual discussions have been documented at the BCU iPad Pilot Blog, but we also met in person once a week to demonstrate and share apps that we discovered. At the end of this post I included links to other iPad pilots from a variety of universities. Each one is a little different, from who is included, how much training they received, to how much freedom the participants have with their devices. In our iPad Pilot, the participants used their own iTunes accounts and synced to their own computers so they could add whatever apps or content they wished. Pilot members were given a small iTunes gift card to help them get started with apps. The first three weekly meetings were used as training sessions to get the group acquainted with iTunes, the App Store, the iPad, and set up access to their campus mail and calendars. You can see very brief summary outlines of these sessions under the Training link on the Pilot Blog. What would I do differently if I could do it over? The biggest change I would make is in the assessment department — I wish there had been time to create some sort of “Before and After” survey instrument to give participants before the Pilot started and then again six weeks later when the Pilot ended for the summer. Without that, the only real assessment tool we have is the blog, which did have contributions from about 60% of the group, but not consistent information. The nice surprise benefit of the Pilot was the social interaction and networking that came about thanks to the weekly meetings. These sessions were casual and open to suggestions from the whole group, which resulted in a lot of peer-to-peer teaching and learning. Several of the participants have asked for such a group to continue in the Fall, even though the Pilot will be over. Some outcomes of the Pilot: lots of local media coverage for the university, classroom ideas for the iPads from several faculty members involved, more e-textbooks are being considered for upcoming classes, video interviews with Pilot members were shown to the university’s Board of Trustees, and many of the Pilot members will be involved in leading a professional development workshop for faculty at the end of the summer. Given the very limited time, planning, and resources we had to put the Pilot together, I consider it a wonderful success. 1. Don’t underestimate the need for some training. Basic tips and tricks can go a long way toward alleviating early frustration with this new device, especially for users who have no experience with the iOS interface. 2. Find at least 3 to 4 different ways to evaluate or document the progress and accomplishments of the Pilot participants, using both qualitative and quantitative methods. Our main goal when we started the Pilot was to give faculty exposure to the iPad in order to start finding ways to implement it in the classroom, but we only have anecdotal information to show how things went. I would suggest having some more concrete objectives in mind, if you can. Have you started something similar? I would love to hear about it in the comments or by email. Thank you! Death to e-classics. Long live e-classics! By the silly word “e-classics” I mean ebook versions of dearly beloved public domain works by authors such as Jane Austen, Charles Dickens, H.G. Wells, Shakespeare, and so on. The first ebooks I read were in fact e-classics – the Sherlock Holmes mysteries, found for free on FeedBooks. Two years ago, I thought the upswell in ebook interest would mean a revival for these classics. They were, after all, the easiest ebooks to get. You can find many different copies of these books for free online as riffs on Project Gutenberg files. In Amazon’s Kindle Store, you’ll see a whole slew of these public domain ebooks for sale from swindlers for anywhere from $.99 to $5. I say swindlers because these are public domain texts and the “sellers” usually haven’t added any value whatsoever from what I’ve seen in sample chapters. Added value to me would include at the very least a linked table of contents (which Amazon should be adding by default but they don’t), or a map, a timeline, something to help readers make sense of the content of the book itself. Last year I started reading D.H. Lawrence’s 1928 novel as a free ebook from FeedBooks, which was using an edition from Project Gutenberg. From the very beginning of the book, the formatting of the text itself was a little distracting — words were run together, the chapter headings were spaced out awkwardly, and there were obvious typos from the ebook conversion process. I was using the Stanza app on my iPhone. I ignored these little aesthetic drawbacks and enjoyed the story anyway. I wouldn’t have known there was anything missing form the copy I was reading if Mark and I hadn’t wandered into a used bookstore one day where they had a copy of the book in their front room. I happened to be at a place in the ebook with some particularly muddled text near the end of a chapter so I flipped through the paper copy in the store till I found that section and what do I discover? Why, the paper copy has an additional page of dialogue in this chapter that my ebook doesn’t have at all! It turns out I was reading one of the “censored” versions of the text. So I bought a *paper* copy of the Penguin Classics edition of Lady Chatterly’s Lover and gave up on the ebook version right then and there. Besides actually having the complete book (!) the Penguin edition also provided me with a map of the English Midlands, a glossary of dialect forms spoken by the characters, and a wonderful appendix of explanatory notes to the text. I would have gladly paid for an ebook version that had all these great features, but from what I can tell, Lady Chatterly’s Lover is not among the select few to be a Penguin ebook. Lots of reasons to read Jane Eyre of late. A) Mark is reading it for a class he’s taking and I enjoy reading and discussing books with him, plus B) there is a new movie version coming out in, oh, a week. Since Mark is reading it for a class, he had a specific edition to look for – namely, the Oxford World’s Classics. Wouldn’t it be wonderful to have this as an ebook for class discussions? See all your notes and questions in one place, quickly find the paragraph or section in question by just doing a search, annotating passages as new themes are brought up in class. Have in-text links to the explanatory notes and back. But no, sorry. Not possible with the Oxford editions. From what I can tell, Oxford is only making their reference and medical titles into ebooks so far. I would dearly love to be wrong about this. Please tell me I’m wrong. This is a classic but not yet public domain. Our local public library selected it as the Siouxland book of the year and they have some great programming planned for it, including a free viewing and discussion of the film based on the book. I was prepared to pay for an ebook version of The Maltese Falcon, but Holy Cow what a mess. First of all, no ebook version comes up on a search in Amazon except, bizarrely enough, the script by John Huston. Lucky me, knowing the author is Dashiell Hammett. How would someone like a high school student even know what they were getting with goofiness like this? Second, I do a generic Google search for it and get all the suspicious looking ebook torrent sites along with – oh! – Random House. Really? Do I have to know the publisher of the book I want in order to find it? Fine, whatever. So I go to Random House’s page for The Maltese Falcon and I click on the little ebook link. From there, I click on the button for “Buy Now” … which gives me a string of links to choose from, including a dead Amazon link and “More…” which gives me 13 links to individual stores. Just give me an ePub or PDF already and let me get on with reading! So I’m not reading or enjoying Jane Eyre or The Maltese Falcon at the moment. Instead, I’m continuing this Educause book I started reading for work. An ebook that was freely available online, as a DRM-free PDF, which I am annotating with abandon and I’m even going to share it with my boss and colleagues when I’m done, which means even more people will be reading it. I can keep it in Dropbox, read it with apps like GoodReader or PDF Expert or even something else, if I want! And here’s something else to think about: I actually prefer to read on the iPad. Over my laptop, over paper. I would rather curl up on the couch with the iPad in it’s clever little stand and both of my hands wrapped around a hot mug of tea. I could read my RSS feeds on my spiffy MacBook Pro, but the design and interface of apps like MoblileRSS make RSS reading on the iPad a beautiful, relaxing experience. 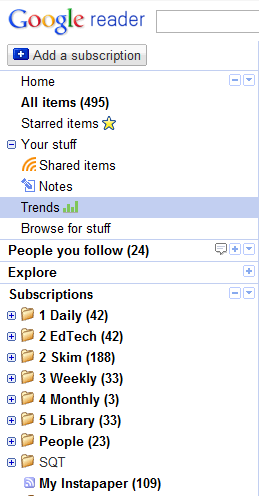 The stats in my Google Reader Trends can attest to that. And I would like to carry this experience over to my book reading, too, but for the moment it is still too hard to find the books I want to read in a format I can use. In the meantime, I both grieve for and look forward to the day when publishers have rendered themselves obsolete to readers. I will sorely miss the excellent supplemental content provided by publishers like Penguin and Oxford, but I will not miss for one second the headaches that publishers are causing their readers.